Women’s wear Fabric Div. : Takisada-Nagoya Co., Ltd. The Women’s wear Fabric Division is our lead force in textile sales for the relentlessly changing women’s fashion market as they perform sales operations through a wide variety of channels. 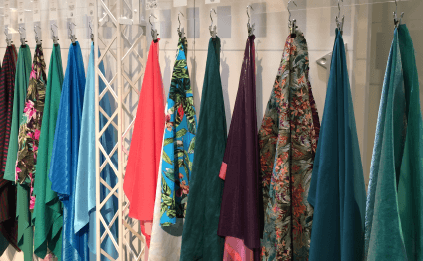 The Division produces various fabrics within Japan and abroad at the Right Place that are the Right Product for the target sector at the Right Time. The three main points for developing and expanding our business operations are as follows. The first is not only can we offer highly refined and high-quality fabrics, mostly either made in Japan or imported from Europe, but we can also provide a wide variety of women’s wear fabrics using raw materials at reasonable prices, mostly produced in China, as well as natural to chemical synthetic fibers. 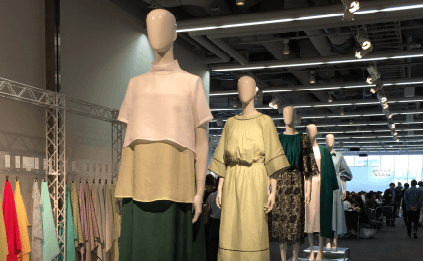 The second is that we use the most recent trends to set our company’s direction, and also seasonally present new fabrics that combine the lifestyles and sensibilities of Japanese women at trade exhibitions. The third and final is that we stock our company with a numerous amount of fabrics in order to always be able to provide a quick response. Although we currently focus on the conversion of materials in Japan, we have gained footholds in some enormous markets, mostly focusing on China, as we continue to further strengthen our converter functions outside of Japan to become a truly global textile converter. Please be sure to visit us at one of the many trade exhibitions we attend. You will definitely find the start of a thread to resolve any issues you are facing.